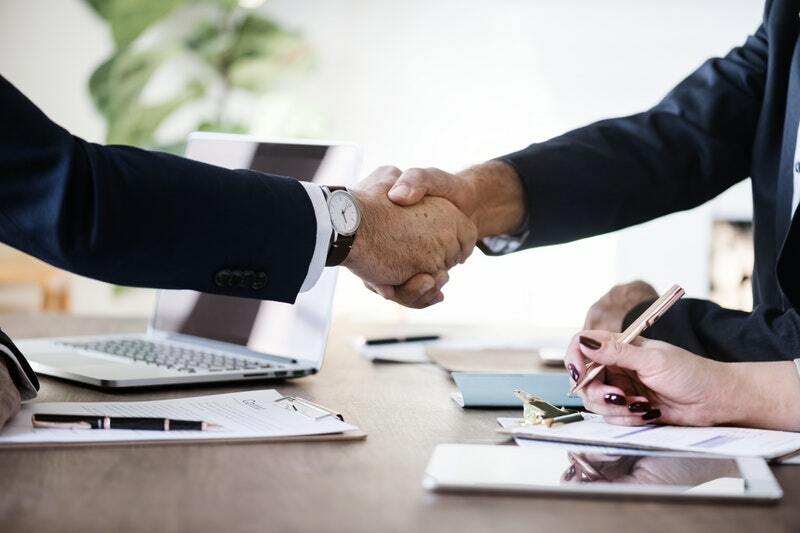 Learn about the progress and experiences of three of Cognitive Institute’s seven Safety and Reliability Improvement Programme Partners—Lady Cilento Children’s Hospital, Sydney Adventist Hospital and Royal Melbourne Hospital—as they transform their organisational cultures. Children’s Health Queensland launches Speaking Up for Safety™ programme and trains more than 3,500 staff in a year! Children’s Health Queensland launched Cognitive Institute’s Speaking Up for Safety programme in May 2015. The implementation strategy was deliberately rapid in design, with the ambitious target of 3,500 attending a Speaking Up for Safety seminar by the end of June 2016. The initial target was exceeded with 3,576 people having attended a Speaking Up for Safety seminar within 12 months. This has been achieved with Cognitive training an in-house teaching faculty of Safety Ambassadors who were carefully selected for their peer influence, presenting skills and recognition in the workplace. There has also been particular support to ensure non-clinical staff are included and feel valued as part of the clinical care team. Initial feedback reveals comments such as ‘felt listened to and ensured best outcomes for patient’ and ‘more confident to speak up’. 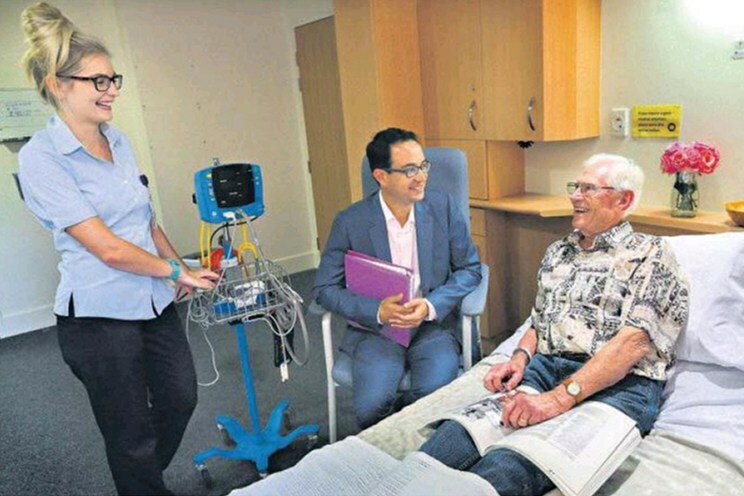 San Education, a department of Sydney Adventist Hospital, launched their hospital-wide Safety and Reliability Improvement Programme to all staff, patients and visitors in April. The Chief Executive Officer, General Manager, Nursing Executive Officer and Area Directors were available during the showcase to reinforce the importance of the programme rollout and partnership between Sydney Adventist Hospital and Cognitive Institute. 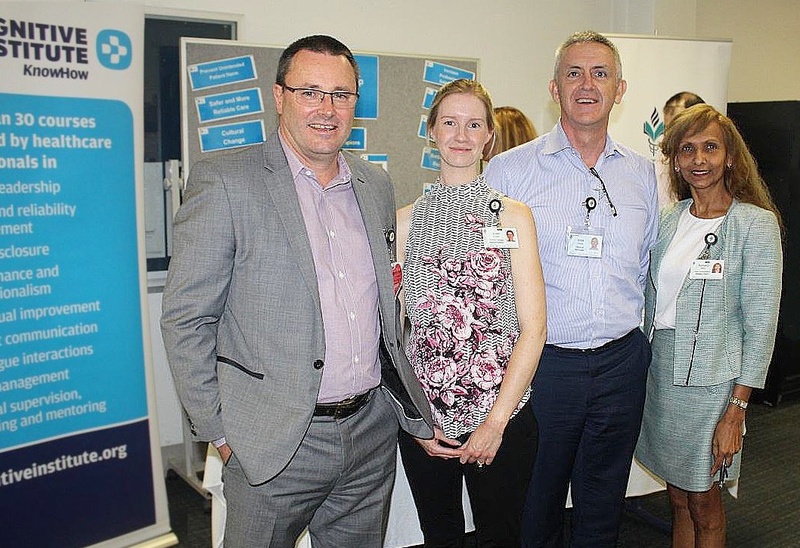 Pictured at the launch are (left to right): Phil Currie, Chief Executive Officer Adventist HealthCare Limited; Jodie Privett, Dietitian and Safety Champion; Brett Goods, General Manager Sydney Adventist Hospital; and Barbara Ward, Managing Director San Foundation. Melbourne Health’s Chief Executive, Dr Gareth Goodier, discusses the recent launch of Melbourne Health’s Safety Culture Program, reflects on the organisation’s motivation for change, as well as highlighting the learnings to date. Our vision at Melbourne Health is simple—to be the first in care, research and learning. This vision provides us with a framework for everything we do. A key measure of our success as leaders will be determined by whether our patients and staff recommend Melbourne Health as a great place to work and be treated. Over the past couple of years, staff surveys told us that we needed to change our culture and leadership. Our staff want to work in an environment where we always put safety first and consistently live our values. This information provided the catalyst for change. We have harnessed this opportunity and are now striving to attain a leadership position in positive culture change. 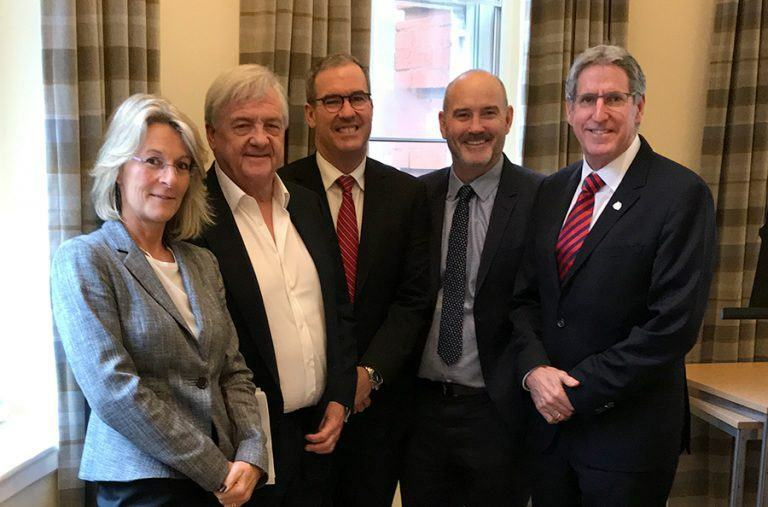 This readiness for change and the associated support from our Board and Executive has proven critical to our success so far, recognising that we are in the early stages of a long-term culture change campaign. This readiness for change was visibly demonstrated at the launch of our Safety Culture Program in March this year. The launch saw more than 100 Melbourne Health managers attend a targeted leaders’ forum to discuss our safety culture programme. The event provided a tangible marker for the positive changes that are starting to happen across the organisation, underpinned by Cognitive Institute’s Safety and Reliability Improvement Programme. The launch represented more than a single event, rather it marked the culmination of 18 months of planning, discussion and training to ensure Melbourne Health was ready for this complex culture change programme. The event provided a tangible marker for the positive changes that are starting to happen across the organisation, underpinned by Cognitive Institute’s Safety and Reliability Improvement Programme. Story-telling is at the heart of what makes us human. Our leaders’ forum gave our Safety Champions the opportunity to share their own personal and powerful stories about the importance of safety culture with their colleagues. These stories acknowledged the vulnerability of patients in our care and the critical nature of safety and reliability improvement. Staff engagement and support for the program is starting to spread throughout the organisation and we are particularly pleased to see the multi-disciplinary collaboration in the planning and development of the program from clinical practitioners. This is a true team effort involving senior clinicians, nurse unit mangers, allied health leaders and non-clinical support staff across the hospital and our mental health services. Building an organisational culture takes time and we acknowledge that our transformation is just beginning to take shape. And yet we are receiving promising feedback from our staff across all disciplines of the organisation. At the time of writing, more than 1000 staff have completed training in Speaking Up for Safety and after two months, around 25 entries have been lodged in the We Care safety system, based on the principles of the Vanderbilt University Accountability Pyramid. That staff are excited to work at Melbourne Health and the program ‘is one of the best things the organisation has done in my 34 years here,’ feature among the comments received. While the process has been overwhelmingly positive, it has not been entirely free of complications. Addressing concerns associated with anonymous reporting, making time within busy schedules for training, and building understanding for the need and importance of cultural change are among the learnings that come with leading in this space. Strategic and well integrated communications that enhance awareness and understanding of the program across the organisation are also essential. On reflection, I am proud of what we have achieved after just 18 months. I appreciate what each and every staff member has contributed and sincerely look forward to the journey ahead. Ultimately, it is our ongoing and sustained commitment to safety and reliability improvement that will deliver a strong values-based and safety driven culture. Does your organisation recognise the need for change? What is the level of readiness for change within your organisation? Clinician engagement is essential. Ensure you have people on board who understand the current culture of the organisation. Gain the support of your Board, Executive and leaders. Recognise that transforming the culture of your organisation takes time and commitment. Remember communication is as critical as your products and systems. 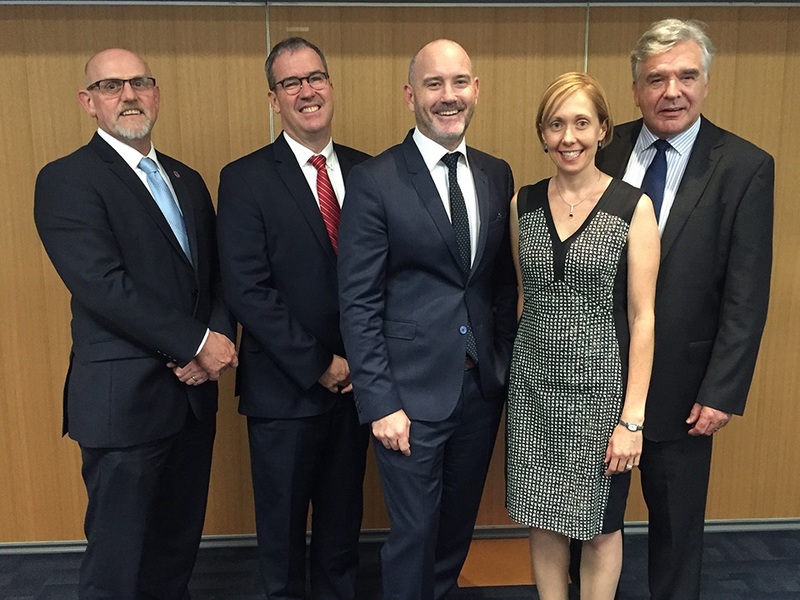 Caption (left to right): Cognitive Institute’s Associate Medical Director, Dr Stephen Walker, Medical Director, Dr Mark O’Brien and General Manager, Matthew O’Brien with Melbourne Health’s Lisa McKenzie, and Chief Executive Officer, Dr Gareth Goodier.